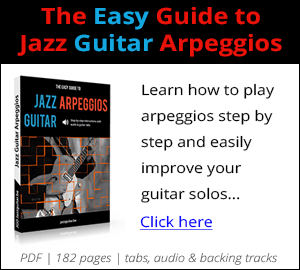 A lot my readers and students ask me what guitar amp they should buy to get a jazz guitar tone. Making your guitar sound jazzy obviously requires more than the right amplifier and guitar. That being said, certain guitar amps do help you achieve a sound that has a jazzy flavor to it. 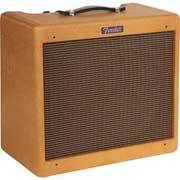 In this article I give you short reviews of the most popular guitar amplifiers used in jazz. To tube or not to tube: do you go for an all tube amp, hybrid tube/solid state or a solid-state amp? The sound obviously, some guitar players swear by it. Note that recent technology innovations make it possible to emulate the sound of a tube amplifier in a satisfying way (Roland Cube 60 and its Cosm amp emulation for example). The overdriven sounds are more musical compared to solid-state amps. They are a pain to maintain. Valves need to be replaced about once in a year. They are noisier than solid-state amps. Tube amps are more expensive. Combo or head and cabinet? 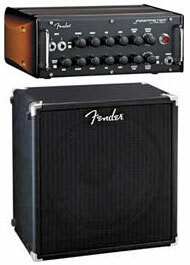 Are you going for a separate amp head and speaker cabinet or for a combo? Separate amp and speaker look and sound great, but combos are easier to transport. Are you a control freak? If you like to tweak and shape your sound, a control panel with a lot of knobs is what you want. If you don't like fiddling knobs, look for a simple control panel. Digital modeling: digital modeling amps, like those from Line 6, can switch from a Marshall to a Fender type amp with the twist of a knob. An amp like the Line 6 Vetta II has over 70 classic and modern guitar amps on board, over 80 effects, 28 speaker cabinets and 3 microphones. The amp models don't sound 100% like the originals, but they come close in my opinion. Some people are crazy about digital modeling, others prefer the original. Reverb: do you prefer spring reverb or digital reverb? Spring reverb sounds more natural, but sometimes it's hard to tell the difference. Tone: what kind of tone are you looking for? Some guitar amps are more suitable to produce a darker tone, in the line of Wes Montgomery and Jim Hall. Other amplifiers are more suitable to produce brighter tones in the likes of Pat Metheny and Bill Frisell. Some amps can do both. Portability: if you do a lot of gigs, then weight and size become an issue. Power: your amp needs sufficient volume to be heard during concerts. Headphone connection: do you need a headphone connection to practice without annoying the hell out of your house-mates and/or neighbors? XLR connection: if you play bigger gigs, you might need an XLR connection on your guitar amp to run through the PA.
Low volume: does your amp sound good at low volumes? This is important if you intend to use your amplifier for intimate gigs or as a practice amp. We'll start with the 3 brands that are the most popular: Fender amps, Roland amps and Polytone amps. There are 4 Fender amps that are popular in jazz circles: the Fender Hot Rod Deluxe, Fender Jazz King, Fender Jazzmaster and Fender Blues Jr. The Fender Hot Rod Deluxe was first produced in 1996. Some guitar players report the bass strings sound muddy. This obviously depends on what guitar you connect to the amplifier. Little headroom: the clean channel is pretty crunchy (from 4 upwards). Single coil pickups keep clean longer, humbuckers overdrive early. Good for Scofield-type sound. The reverb is a bit over the top. You'll never go beyond 2. 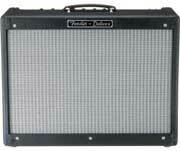 The Fender Hot Rod Deluxe is extremely loud for its size and wattage. Very sturdy and portable, ideal for gigs. Versatile amp. Besides the clean channel, there are 2 distortion channels. One trick pony, don't buy it for distortion. The reverb has a long decay and can only be used at very low settings. Designed for a clean tone. Very versatile tone shaping, doesn't sound sterile in any way. Punchy, warm and clear tone. The drive channel gets noisy when you push the gain past halfway. Doesn't sound good in overdrive. The tubes are a bit loose. Way louder than you'd expect for a 15W amp. 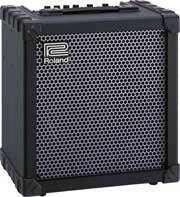 2 Type of Roland amps are popular amongst jazz guitarist: the Roland Cube 60 and the Roland JC-120 Jazz Chorus. 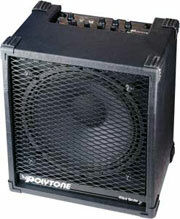 The Roland Cube 60 is clearly a winner, very popular jazz guitar amp with amp emulation that works. Besides being very good, it's also one of the cheapest amps in this roundup. The Cube 15, 20 and 30 exist as well, but while they are good practice amps, they don't compare to the Cube 60 (update: a reader reports using 2 Cube 30s work even better than 1 Cube 60). Jack input is a bit fragile. Very portable because of its size. Includes quality digital guitar effects: delay, reverb, chorus, phase, flanger and tremolo. Amp emulation: 9 COSM amp models (including the JC-120).. 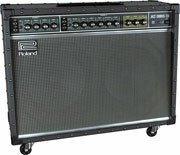 The Roland Jazz Chorus was first made in 1975, it was one of the first guitar amps with built in effects. This amp is a real classic, it is played by many of the greats, Pat Martino, George Benson, Larry Coryell, ... It is also the amp I play on most of the time. Very heavy, but it has wheels. Amazing sound, clean and warm. Has a vibrate effect built in (besides chorus and reverb). Very solid, built to last. Can also be used as a bass, keyboard or vocal amp. Rumors are that Polytone amps are prone to breakdown and that factory service is not so great (I can not confirm this though). Peavey doesn't have a very good name, but the Classic 30 is quite popular for jazz and is a reliable and good sounding amplifier. Some people report tube rattle. Good clean sound, good distortion sound. 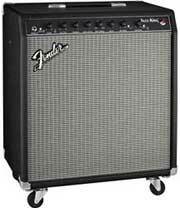 Fender Twin Reverb: classic tube amp, known for its clean tone. Delivers 85W through 2 12¨ speakers. There's a reproduction of the vintage '65 Twin Reverb available at about $1300. Loved by many people, though I'm not such a big fan myself. Yamaha Amps: played by Mike Stern, Allan Holdsworth. I can't tell you a lot about these, never heard them live to be honest. Mesa Boogie Amps: Mesa Boogie amps are known as rock and roll amps, but they perform very good for jazz as well. John Scofield, Allan Holdsworth, Larry Carlton and Frank Zappa all play or played Mesa Boogie amps. AER Amps: AER is a German company that produces acoustic guitar amplifiers. They are popular amongst gypsy jazz guitarists. Acoustic Image Clarus Little Head: great amp head for jazz, has an extremely clean tone. It is often combined with a Raezor's Edge speaker cabinet. This amp is not very expensive considering its audio quality (around $500). 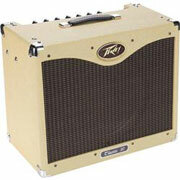 Tech 21 Trademark TM60: 60W solid state guitar amp with analog tube emulation. Good clean sound, the distortion ****s though, but hey, we play jazz, we don't care about the distortion. Carvin Nomad: 50W all tube amp at a reasonable price (around $500). Very warm sound and tons of headroom. Evans Amps: Very well-built and high quality amps, they cost more than the average amp though. The choice of the pros. Played by John Abercrombie, Ron Eschete, Buzz Evans amongst many others. Jazzkat Amps: Sweet small guitar amp with a big tone, very portable (weighs only 23 pounds). 110W, smooth highs and rich bass. Played by Bucky and John Pizzarelli, Jack Wilkins, Joe Beck, Vinnie Carrao, Jeff Linksy, Joshua Breakstone, Randy Johnston, Sheryl Bailey, Ulf Wakenius, Andreas Öberg and Tony DeCaprio. Vox AC30: good sounding amp, John Scofield used to play them, but they are very prone to breakdown (I'm talking about the Vox AC30 cc2). Henriksen Jazzamp: solid state amps, come in combos or seperate head/cabinet. The Jazzamp 10 is 80W, the Jazzamp 12 is 160W (designed for acoustic bass, also works for guitar though). These amps have a lot of clean headroom and a warm sound. There's also the Jazzamp 10-R, with reverb (the other 2 don't have reverb). Played by Larry Coryell, Jimmy Bruno, Joe Diorio, Jim Hall, Howard Alden, Ronny Jordan, amongst many others. Join our discussion about the ultimate jazz guitar amp in the forum.